Friday Sept 30 6:00 pm Cheese Fest! Bloomy Rind connects Nashville to Artisan Cheese is throwing a Cheese Fest party at the Nashville Farmer's Market 900 Rosa Parks Blvd. Saturday Oct 1, 7:30 am, Shelby Bottom Boogie, 5K and 15K, Starts at Shelby Park: $35 on race day, proceeds benefit your waist line, cardio pulmonary health, and CASA of Nashville. For me, a 15K will hopefully off set some of the fun, food and drink to come for the rest of the day. Saturday, Oct 1, 10 am: Zombie Flash Mob Practice at Parking Lot R (this practice is CANCELED but rescheduled for next weekend Oct 8th) at the football stadium: There will be a Zombie Flash Mob on October 22nd to promote the Zombie Buffet 5K to be held on October 29th. The 5K is a fundraiser for the Nashville Rescue Mission. Be a Zombie and chase after those humans (Zombies call them humies) and encourage those humies to run faster! Saturday Oct 1, 10 am - 6 pm Celebrate Nashville! Culture Festival! at Centennial Park: UPDATE, Culture Festival - QUITE POSSIBLE THE BEST ARRAY OF FOOD AT ANY Nashville festival! THE BEST!! Celebrate Nashville! Culture Festival used to be named Celebration of Cultures, and admission has always been FREE! In the beginning, it was a humble little celebration held at the Scarritt Bennett Center. At the start "food vendors" back then were seemingly the organizers' parents and friends putting together some fried rice and noodles. NOW, wow! Nashville has embraced this event, and there are 5 stages of for performances, a "World Marketplace", kids games, exhibits, and OVER 60 FOOD Vendors! Yes, you read that correctly, 60 food vendors from A-Z, that would be Abay Ethiopian to Woodland vegetarian Indian food with everything in between! Saturday Oct 1, 11-7 pm The Music City 1st Annual Hot Wing Festival at Walk of Fame Park: The hot wing festival doesn't say that there will be vendors there, but I have a feeling that 400 Degrees (my favorite hot chicken wing) will be there. 400 Degrees is going to be closed on Saturday, so I think they may be heading to the hot wing festival. I hear it is $20 for tix, and there are $10 discounts at Mapco. Proceeds benefit Ronald McDonald House. I gotta tell ya Ronald McDonald House in NYC helped save my little cousin's (2nd cousin) life. She was just 3 yrs old with a giant cancer tumor growing on her brain stem. The 1st round of doctors in Detroit claimed they got 90% of the tumor, charged a ton of money and she was worse off after a year, could not walk nor talk. Come to find out they just cut her open and took out only about 10%. So, my relatives were broke, 2nd house mortgage, and a parent who lost her job, they had no money, and were losing hope. Then, a world known NYU pediatric brain and brain stem cancer surgeon offered to perform the surgery for free! Broke, they had no money to stay in NYC, but then Ronald McDonald House came to the rescue. The NYU surgeon and Ronald McDonald House save my little cousin's life! My little cousin who is a doll is now 16, happy, she can talk as well as any teenage girl, she can dance and she is cancer free. Thanks NYU surgeon man and Ronald McDonald House! Saturday Oct 1, 1-7 pm Nashville Beer Fest, Waterfront Park: Well, for $30 you get a pint glass and unlimited number of tastes of 100+ beer from about 50 beer makers! For designated drivers tix are only $10, but unclear if there will be anything else to drink besides beer. But, the main charity for this event is Second Harvest Food Bank, so drink up, bring a designated driver or walk to your hotel room after the event. Saturday Oct 1, noon-7 pm Schermerhorn Free Day! Yes, Nashville Symphony Hall, the Schermerhorn will have music events in all 4 areas all day for free! The Laura Turner Music Hall, the Courtyard, the Main Lobby and Mike Curb Educational Hall all will have various music going all day for FREE! Stop in, it is free! Saturday Oct 1, 6-9 pm 1st Saturday Art Crawl downtown Nashville: Free to look! All the art galleries downtown are open showing their artists' art! Many galleries have light snacks and beverages. There is a free shuttle that goes from the main area of 5th and Church down to 8th and Broadway to TAL, and 4th Ave South to the Lost Boys Gallery. It is free to look, as I said, and there is art available at every price range from $5 - $5000+. Saturday Oct 1, 5-9 pm Bellevue Cruise-In at the the Sears side of the Bellevue Mall: This is the last Cruise-In for the year (1st Saturday April thru October) and this one is special because all the area Corvette clubs are invited to show their cars. I wonder if they would let my display my classic 11 year old Honda Civic, classic Honda silver color, classic 4 door body time, classic windows, classic hub caps, classic engine, classic chassis: it is a classic. It may be a bit sap and bird poo covered, but otherwise it is in great classic shape. Sunday Oct 2, 3-6 pm, Battle of the Food Trucks at Greer Stadium: For $25 you get tastes from a bunch of Nashville Finest Food Trucks and a drink ticket. Bring 5 canned items for Second Harvest Food Bank, and get a 2nd drink ticket! What a deal! Seriously though, I love food truck and food carts because in general, trucks and carts do one type of food well, not a huge menu of mediocre food. Also, a word of advice, there will be a shortage of chairs (aka there will be no chairs provided), so bring a chair. Oh yea, I forgot, I gotta fit in some college football on Saturday too! OK Y'all! Come get Fried With Me! I am heading down to the Annual Southern Fried Festival this weekend located on the Columbia, Tennessee Town Square! There will be fried foods, crafts, music, and games for the kids! It i gonna be a crunchy fried good time! I have spent 2 weeks eating really healthily, lots of fresh veggies and whole grains, just to get ready for the Southern Fried Festival! See you there! Get a bag of raw pizza dough from the grocery store. Get a bunch of Roma, Amish paste, or San Marzano tomatoes, de-seed, and blend. Get some mozzarella. Cut some red peppers, oregano and basil from the garden. Get other yummy toppings. Slice toppings. Spread dough into a pizza shape. 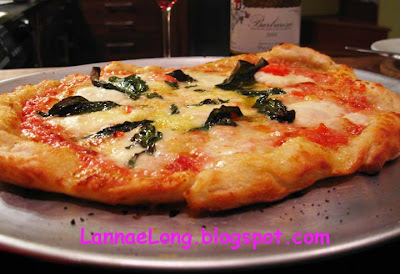 Top dough with blended tomatoes, other toppings, cheese and herbs. 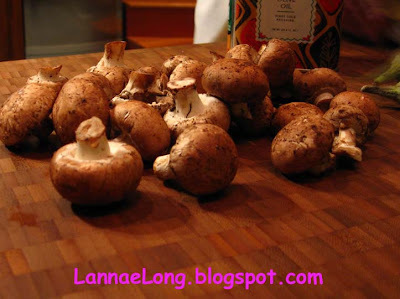 Place on pizza stone in a really hot oven. 10 min later, eat. How to find Barocco, drive down Madison, and don't blink because is a plain vinyl siding store front with a plain black and white sign. There was plenty of free parking on the streets near by while we were there at the noonish hour. Again, this little store front that doesn't look like much (there are many delicious gems with plain store fronts in Cleveland!) but boy-0-boy does the food pack a culinary punch! Just delicious, flavorful, and Columbian street food that warms your heart. This Columbian style restaurant has only been around for less than a year, and I believe it will be around for a long delicious time! The specialty here is he arepa sandwich with a side of arepa fries. Arepas are street food sandwiches in parts of Columbia. The bread portion is a hominy based bread that is similar a very thick corn tortilla mixed with a polenta, and the bread is as sturdy as any wheat based bread. Juan and son, chefs and owners of this pop & son place, make the arepas in-house by hand everyday, and they make the arepas the traditional way (takes time to make these right) and they don't cut corners on this amazing corn based tortilla bread. The arepas a stuffed with corn, cheese (or no cheese for vegans), onions, peppers and a choice of protein (or not if vegan) including grilled diced chicken, beef, pork, chorizo, ham, bacon or tuna. I just think all of them are delicious! They also make their own arepas fries too from the arepas dough, deep fried like a French fry. OMG! I am still thinking about this meal! The best part about it, that one arepa cost only $6, and the with a side of arepa fries and a soda, you are looking at about $9-10 lunch. Take friends with you to share an order of the fries, as the arepas are filling enough for lunch. In addition to the arepas and arepa fries, are the traditional Columbian street food sauces, which are also made in-house in the traditional ways. The sauces are a spicy peanut, a creamy chimichurri, pineapple, ranchero, and creamy garlic on the day we were dining. 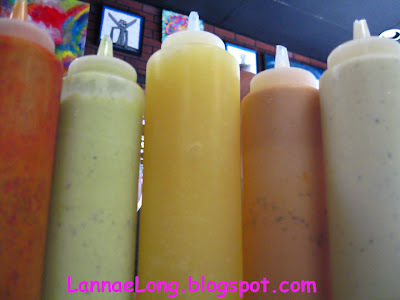 My dining buddy asked Juan why the various sauces, and Juan said that these are the sauces that are traditionally offered at most any Columbian street food cart, so he offers them here. On this day, we ordered the chorizo and the chicken arepas, regular fries and arepa fries. 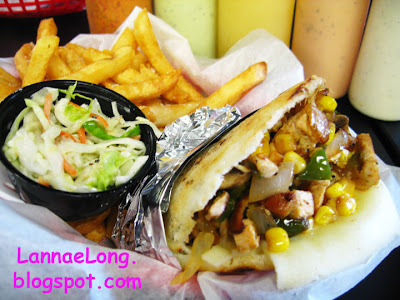 The chicken is arepa is diced chicken sauteed with corn, onions, green peppers, cheese and Columbian style spices. I am guessing there may be some salt, paprika and chilies in the spices for the chicken arepa and I am not sure what else. The chicken was well seasoned and delicious. The chorizo sandwich is filled with a Mexican style chorizo, corn, peppers, and cheese as well. The chorizo is spicy flavorful, not burn your face hot. The fries, well, I ordered regular fries because I did not know better. The regular fries are fine, and fair carrier for the delicious sauces. But, the really fries to order are the arepa fries. These are the hominy corn fries that are house-made by Juan everyday. These little gems are like no other French fry you will ever have. The inside is a little bit like polenta or grits, with the outside being nice and crunchy from being deep fried. The arepa fries are the perfect vehicle for the house-made sauces. Another added bonus about this restaurant is that the owners are really nice. I mean they came out from behind the counter to say hello, and find out how we liked our meal. They genuinely want to know how we liked it, and they really hope they made scrumptious food we love to eat. We did love this food, not only because it was flavorful, and tasty, but we could really taste the tradition and love that goes into every part of the preparation of the dish. The owners are nice. And as I have said before, Nice goes a long way. Nice is just another bonus here, and will keep me coming back. Barocco, I will see you the next time I am in Cleveland. I love eating your arepas! The other day, I really wanted to make a burger because I have some really good Kenny's Farmhouse Blue Cheese, and I thought it would be perfect in a burger. I have never made one of these burgers, but I was planning on getting some local organic pastured ground beef, and then putting some of the blue cheese in the middle of the patty (incapsulated), then throwing the burgers on the grill, and then eating them on crusty French bread. Well, the logistical problems I had with this plan was that I was completely out of local pastured ground beef, and it involves the Man because I don't know how to work the grill. Our grill isn't just turn the gas or propane on, or throw some coals on, it is a wood burning grill, local hickory wood burning grill to be exact. The Man was out doing thing of more importance, so I abandoned that idea, and went with some stove top heirloom tomato sauce with herbs and chilies from my garden as the basis for dinner. I thought about a cheese stuffed burger every day since then, and thought about the logistics, spices, how to do it because I actually have never made a stuffed burger before. Then, one Friday, as I was driving home in the early evening, as I passed by Jackalope (the only woman owned micro brewery in TN), I saw the truck, and I had to stop! 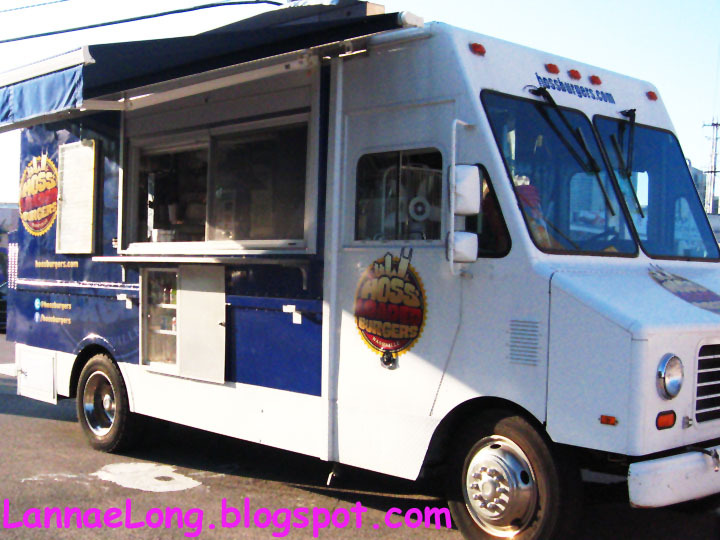 It was the Hoss' Loaded Burger food truck! Holy crap, I wanted a loaded burger, and here it is! Screeching to a halt, and pulling into the parking lot of Jackalope (well, I didn't screech, it was more of a turn signal, safely slow down and turn into the parking lot) and I looked at what Hoss' had to offer. We ordered the Hoss, and the Sherry. The Hoss is a cheddar stuffed burger with bacon and onions, ad he Sherry is mushroom and mild cheese burger. It was exactly what I was thinking about for days and days! Not only does Hoss' serve up stuffed burgers, they use Gourmet Pasture beef, a local pastured, no hormone beef farm with really great beef and buns from a local baker from West Nashville. I looked into the truck to talk to Dallas (the owner), and I told him I had been thinking about making a stuffed burger myself for days on end, but never did. Now, with Hoss' I don't have to, he can just making 'em for me. They are good burgers. Once you bite into the burger, you get a little treat of cheese oozing out from the middle to mix with the really good toppings. 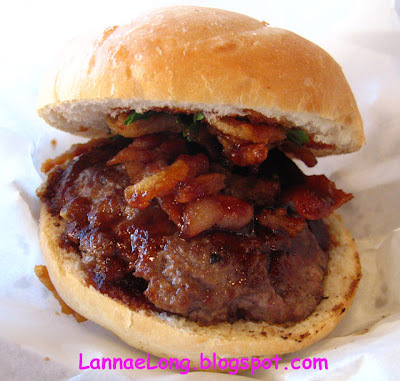 I really like the cheddar burger because of the flavor combination of bacon, onion and cheddar. The stuffed burger has a different mouth feel, texture and flavor perception than just melting cheese on top and then piling on other toppings. It is bit of surprise to get the oozy cheese once you get to the cheese in the middle of the patty. It is just a fun and surprising way to eat a burger. Then, the next Friday, as I drove home, there Hoss' was in the Jackalope's parking lot again! I "screeched" in to the parking lot to pick up dinner on the go. OK, I didn't screech again, and I did safely signal and turn into the parking lot to see Dallas and get burgers for our dinner. I kept on looking at him, and then a light bulb went off. I know Dallas, whose nickname is Hoss. He and I used to belong to the same Corporate Downtown Nashville Lunch Bunch. 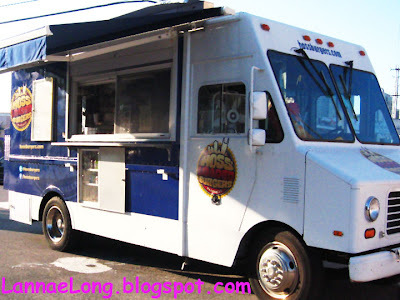 Dallas gave up a corporate career with a very successful company (even in the economic down turn his old company was doing well) to try his hand in a loaded burger food truck. Dallas has been thinking many many moons about his loaded burger concept, and he has spent many many moons trying different flavor profiles for his burgers. Then one day this summer, Dallas just made the jump from corporate American to his own food truck serving up stuffed burgers. I wish Dallas much luck in his stuffed burger endeavors. Go look for him and his loaded burger truck on the streets of Nashville.